Details: Mud Puppies ~ (Ages 5 – 8) Session 1: Tuesdays, 4:15 - 5:45 pm. February 5 - March 12. 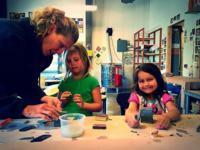 Instructor: Sheila Anderson Kids love to get their hands dirty! Students will explore the world of clay by creating their very own mugs, plates, sculptures, treasures and more. The final weeks of class will be spent glazing their projects. Open to all experience levels. $80/student, $68/member. *When signing up for a class, if you wish to bring a guest, indicate the number of guests under the ‘Guest Registration’ line. If you intend to attend the class on your own, please leave this section blank, so as not to register for extra spots and incur extra costs.